Having been a volunteer for King Street Cats for more than two years, I can tell you without a doubt that some of the world’s most powerful words are: “But, Mom [or Dad], look how cute he is!! !” Especially when those words are undoubtedly true. Actually, the power of those words is one of the reasons that we don’t do same day adoptions at KSC. We believe that pets, be they feline or otherwise, should be cherished members of the family. And we also know that they are a huge commitment, meaning that pet adoption is never a decision that should be undertaken lightly or on a whim. Springtime is an important time of year to remember thatn all pets — even those that seem “simple” at first blush — are a commitment and a promise. As Easter approaches, it isn’t unusual to see a wide range of groups offering bunnies and chicks for sale. Scampering around, seemingly half fluff with oversized eyes, they are undeniably adorable and even the hardest of winter-hardened hearts softens at the special beauty of children and animals bonding. But, it is important to remember that just as surely as winter turns to spring and spring to summer, bunnies and chicks will one day become rabbits and chickens, neither of which is as simple a pet as they seem when they are cute and tiny (and, especially, held in a tiny set of human hands paired with perfectly-tuned pleading faces). Rabbits are not low-commitment pets. PetMD notes that they often live upwards of 10 years, meaning that pet bunny may still be home when the child he was given to has leftave the nest! While some do like being stroked, few rabbits enjoy being held and most simply aren’t as cuddly as the cartoons might make one believe, which can be especially heartbreaking to a small child. Furthermore, rabbits are not happy living in a small, confined space. Experts suggest that any rabbit cage be at least four feet by four feet, and many recommend that pet rabbits simply be allowed to roam in a room or even a house. My House Rabbit — an advocate for pet rabbits, to be sure, but also an advocate for being fully informed about what rabbit-parenting involves — adds that they are highly intelligent animals that need regular interaction and exercise. Combine this with their innate need to chew and it means that “bunny proofing” is a very real thing! And, much like dogs and cats, rabbits need regular veterinarian care to stay healthy and to keep behavioral problems in check. Failing to have a rabbit spayed or neutered may lead to aggressiveness or urine spraying. Vet care for a rabbit can cost some $800 per year, not much different from the bills for a small cat or dog. As for their feathered friends, The Spruce doesn’t mince words when it warns: “Baby chicks are a terrible Easter gift.” Chicks (and ducklings too) require indoor and outdoor space. In fact, purchasers should check local zoning laws since many places consider them to be livestock, not pets, which means they do not allow them in residential areas. In the same vein, their diet means regular trips to a specialized farm store, not just your local pet shop. Also, salmonella is a very real danger. The bacteria is found in chick and duck feces, but easily spreads to their feathers and talons. It gets passed along when the animals are handled, coops or water dishes cleaned, or even through clothing worn around the animal or its home. A particularly apt warning in the context of this article and for children: Don’t kiss a bird or snuggle it close to your face. While most salmonella infections don’t require hospitalization, they can lead to some pretty awful gastrointestinal distress. And, even more than with rabbits, few see the chicken or duck that the tiny fluffy critter will quickly become. 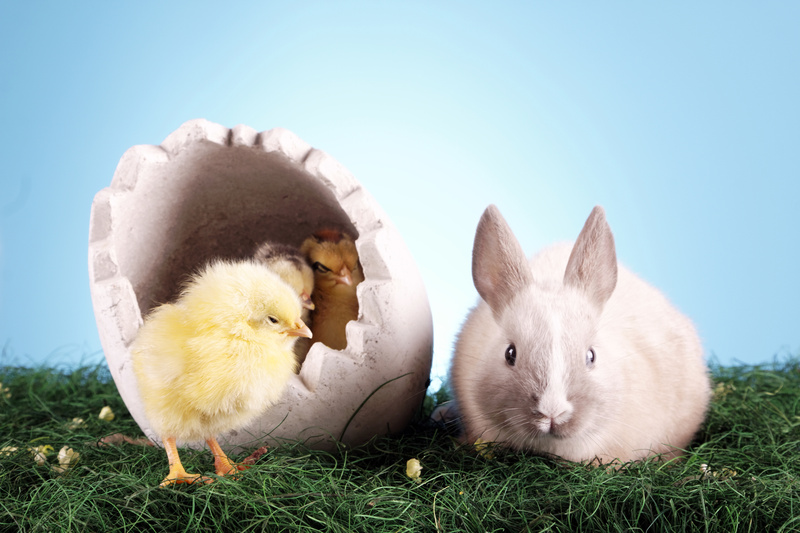 Sadly, humane shelters often find themselves inundated with bunnies and chicks a month or two after Easter when the novelty wears off and the reality sets in. Statistics are hard to find and the subject of much debate. It is hard to imagine that these often informal Easter pet adoptions are tracked with any regularity. And many Easter pets are, sadly, simply abandoned to the great outdoors, a fate that is all but certain death for a domesticated animal (even if the animal was only domestic short-term). On a much broader note, giving animals as a gift is rarely a good idea. The only real exception is when the pet has been specifically requested and when the gift giver is certain that the animal is wanted and will be cared for properly. When the recipient is a child, this means making sure that every adult in the household is fully on board. After all, a child may truly intend to keep a promise to care for a pet’s every need, but follow through is not always a kid’s strong suit. Pets can be a wonderful part of any family — as my own cats, Smoky Tiggs and Sweet Potato Bailey Burns, would gladly tell you (they’ll also tell you they are in charge, and they’d be right). Pets can teach children (and adults) about responsibility and, perhaps more importantly, about pure, unadulterated love. But pets should be a carefully considered choice, not a passing whim. No matter how cute. Burns has worked as an attorney in a large firm, as a recruiter, and a ghostwriter before finding a dream job playing with words all day as a Legal Editor. Ready to stay put, felines Smoky Tiggs and Sweet Potato Bailey Burns kindly allow Cheryl and her husband to live with them in Springfield. Centers for Disease Control, “Keeping Backyard Chickens and Other Poultry,” CDC Features (updated June 8, 2018, https://www.cdc.gov/features/salmonellapoultry/index.html). « Keep Your Chin Up! !